This road, along with Rt. 64, form what is known as the "Dinetah Scenic Road" through the Navajo Nation in Arizona. From this route drivers can access Canyon de Chelly, Window Rock, the Lukachukai and Chuska Mountains, Fort Defiance, and Navajo Lake. 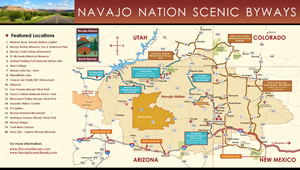 "Navajo Nation Scenic Byways, including Navajo Route 12" by U.S. Department of Transportation and the Federal Highway Administration is licensed under Public Domain. 2005 Native Roads: The Complete Motoring Guide to the Navajo and Hopi Nations.